Check out the new drawing tool! Did you notice that we have added a new drawing tool to Hatena Blog? Now you can easily add drawings to your blogs, and you are not limited to just 3 colors! Learn more about the drawing tool at the Hatena Blog Developer's Blog. Invite your friends and family to try Hatena Blog, and help us to build the world's greatest blogging community! Thanks for your feedback, everybody! I would like to thank everyone who posted feedback on the blog post last week about doing weekly blog topics.There seems to be good amount of interest in weekly topics, so I plan to introduce them here soon. The Hatena Blog programmers need to create a system so that we can post our weekly topics easily, and once that it ready I will make an announcement here and on the Hatena Blog Developers Blog and we can get started. Thanks for your patience as we get things ready. In front of drug stores in Japan you can often find cute mascot statues. Some of the more famous ones are an elephant named "Sato-chan" and "Kero-chan", who is the frog pictured below. 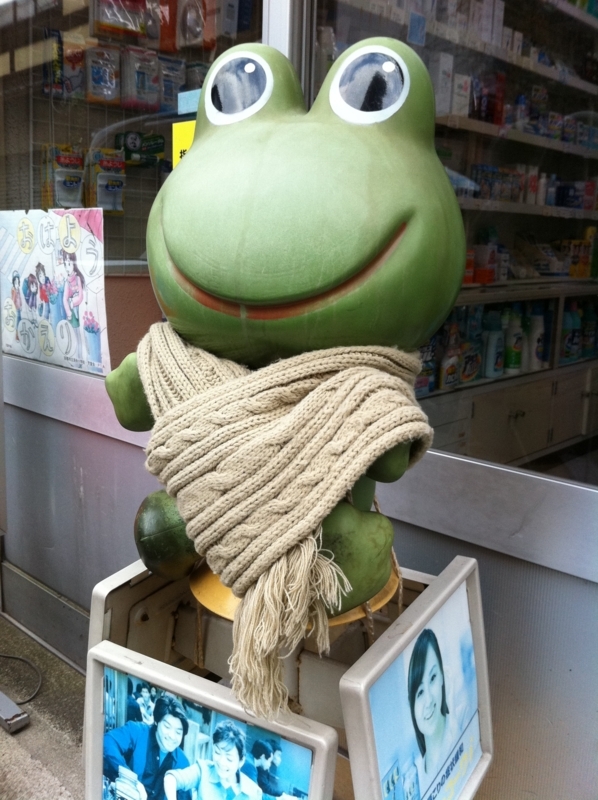 I like this particular Kero-chan, because the owner of this drugstore often dresses him up in seasonal clothes. 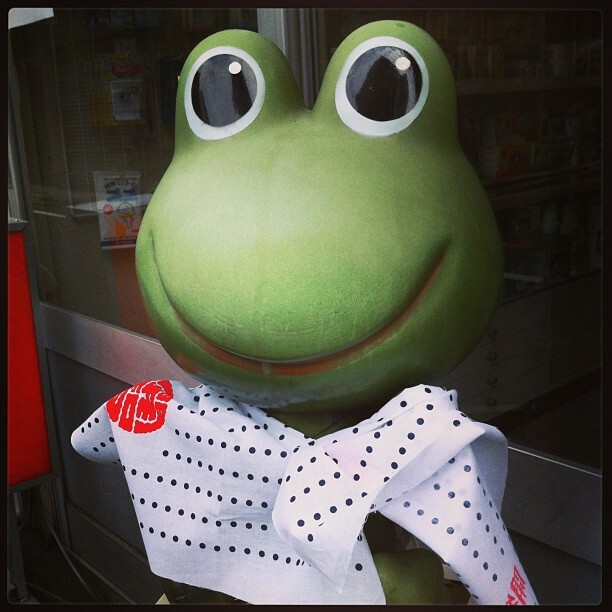 In the photo above Kero-chan is wearing a light cotton Japanese cloth scarf with a summery design on it. I posted another photo of this same Kero-chan frog some time ago in the Flipnote Hatena Weekly News, where he was wearing a winter outfit. It's brutally hot outside in many parts of the world these days, so why not stay somewhere cool and write a blog to share with the world? Hello Flipnote Hatena Group Members! This is Aaron at Hatena in Kyoto, Japan with a update about what has been going on here since the Flipnote Hatena service closed. Hatena released the English version of Hatena Blog at the end of May, and since then over 640 members have joined the Flipnote Hatena Group. We enjoy checking out all your blogs, and would like to thank everyone who has joined! Recently, we made some improvements to Hatena Blog including translating the entire Hatena Blog Help section into English as well as the Community Guidelines. We hope these additions can help answer some of the questions you might have about using the service. Last week we added the ability to confirm your Flipnote Studio ID/password for use with Flipnote Studio 3D for Nintendo 3DS on the Flipnote Hatena website. Previously this could only be done from Flipnote Hatena for Nintendo DSi. Flipnote Studio 3D and the online services for it are being developed by Nintendo. Please visit the Nintendo website in your region for any questions you may have about Flipnote Studio 3D for Nintendo 3DS. Several people have contacted us requesting to continue the weekly topics that we used to do on Flipnote Hatena. I personally think this is a great idea, and I am considering to create a weekly topic here on Hatena Blog. Please let me know if you would be interested in taking part in a weekly blog topic, and feel free to share any ideas that you might want to write blogs about. You can write your feedack in the comments section of this blog entry. 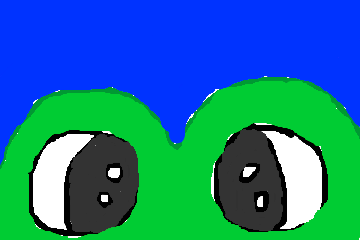 I thought that continuing the frog sightings section might make a nice addition to the Flipnote Hatena Group, so here is the first one. This time, I would like to introduce a photo by a user named Imboo. 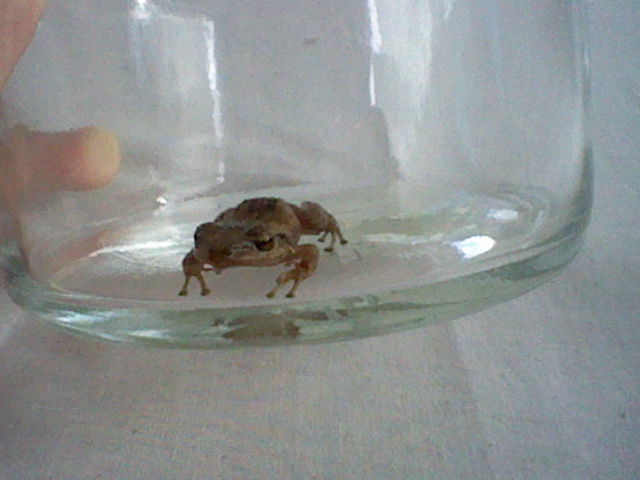 Imboo wrote: "I found this Coquí in my pool." Thanks for posting your frog sighting, Imboo! If you have any frog sightings of your own that you would like to share, post them on Hatena Haiku at the link above, or write a blog entry here on Hatena Blog. Hatena Blog is a completely different service from Flipnote Hatena and is still a new community. We are happy to have the opportunity build this new blogging commmunity together with all of you, and are looking forward to reading your blogs.